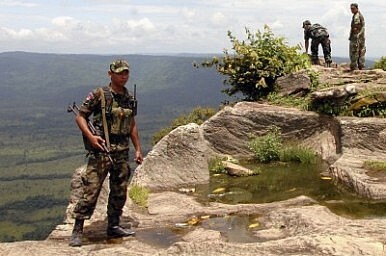 The International Court of Justice (ICJ) ruled today that both Thailand and Cambodia should pull their troops out from the site of the Preah Vihear and establish a demilitarized zone around its ruins in order to facilitate negotiations to finally end the long-standing row between the two countries. The 11-5 ruling from the judges on the court has been seen by some observers as a win for Cambodia, as it was Phnom Penh that had requested that the ICJ mediate the dispute. However, Thai Foreign Minister Kasit Piromya, Bangkok’s representative at the court in The Hague, Netherlands, stated that he was satisfied with the decision. As I wrote last week, this dispute centres on the 11th century temple located along the border of the two countries. A 1962 ICJ ruling gave sovereignty of the temple to Cambodia, a point that Thailand doesn’t dispute. Thailand, however, claims the land surrounding the temple. It had mostly been a relatively benign issue following the initial ruling, but the conflict took on heightened significance in 2008. The ratcheting up of hostilities coincided with large scale street protests in Thailand organized by the People’s Alliance for Democracy (Yellow Shirts), the ultra-nationalist collection of royalists, socialites, and oligarchic elites who successfully toppled an opposition-led government and politicized the temple dispute by making it a matter of national pride. Thailand’s passive reaction to the ICJ’s decision, combined with the PAD’s abysmal showing in the country’s elections earlier this month, likely means that the conflict will retreat back into relative obscurity. Students of applied international relations know that a ruling from the ICJ becomes international law, although there’s no enforcement mechanism to ensure compliance. Still, it isn’t anticipated in this case that either Thailand or Cambodia will disregard the court’s judgment.